This is a story about the whole series of simply unbelievable accidents, which happened to one airplane within just a few minutes. Why did a usual flight change into a nightmare and why, despite a certain crash, nobody on the board got even hurt? It was 24 Juna 1982 when the British Airways Boeing 747 was flying from the Malaysian capital, Kuala Lumpur to Perth in Australia. In fact, the plane has started its journey few days earlier in London, from where it was supposed to reach Auckland, after making several mid-landings. 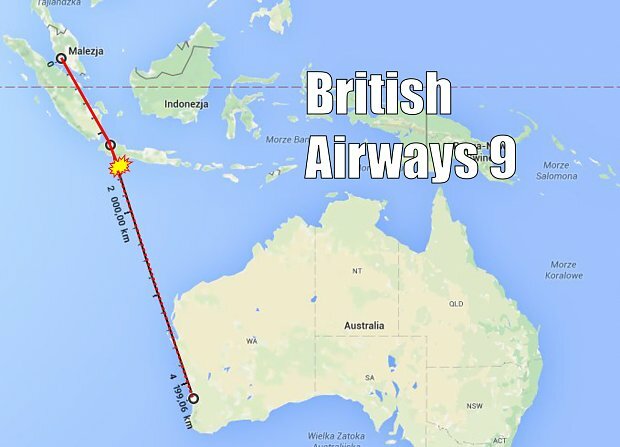 The aircraft had already passed over the Indonesian island Java and was flying with 283 on-board over the Indian Ocean. Although it was getting dark, the weather was nice and the clear sky around the jet was confirmed by a weather radar – device, which detects steam in the clouds and shows it on a screen in a cockpit. A while after 8:40 pm of a local time the first strange things started to happen. Pilots spotted so called ‘St. Elmo’s Fire’. This is the name of electrostatic discharges which appear on plane’s leading edges, meaning e.g. its nose or wings. Such phenomenon is seen most often as blue lightnings on the fuselage. It usually occurs when the plane is flying through a electrically charged thundercloud. However, in the case of our flight, the weather radar was still showing the clear sky, so the pilots had no idea about the origin or a cause of St. Elmo’s Fire. Few minutes later the situation began to be much more serious, because suddenly, one of the engines switched off. Earlier it was working without any troubles and the airplane itself was fueled not so long ago – also the indicators were showing full fuel tanks. On the other hand, one non-working engine shouldn’t be considered as a huge problem yet, because every airplane is built in a way, that it can safely flight and land with only half on the working engines and Boeing 747 has four of them. However, the situation started becoming even worse very fast, because a while later the second engine stopped working. The crew didn’t even have a time to inform anyone about the problems, when last to engines also went out. Pilots were strongly confused and it’s fully understandable, since the situation, when all the four engines stop working almost simultaneously is nearly impossible to occur, especially, when there are no fuel problems. Also the passengers didn’t have a nice moments then… They saw both St. Elmo’s Fire and huge, few-meter-long flames coming put of the engines. Therefore, some of them started writing good-bye letters to their families on their board-passes. The plane’s captain remained level-headed and did the right thing – he was trying to call for help, by informing an air traffic controller about the situation. However, also here some problems occurred – there was some strange noise on a frequency, which made the conversation incomprehensible. Although the pilot was saying about four not working engines, the controller understood, that the crew has some problems with only one engine number four! Pilots and all the passengers were left without any help, with no engines, over a huge and cold ocean. But there was still one way left. Every airplane has wings, so it can fly a little bit further even without engines. However, weighting 160 tones Boeing 747 isn’t a glider and without thrust it descends quite quickly. 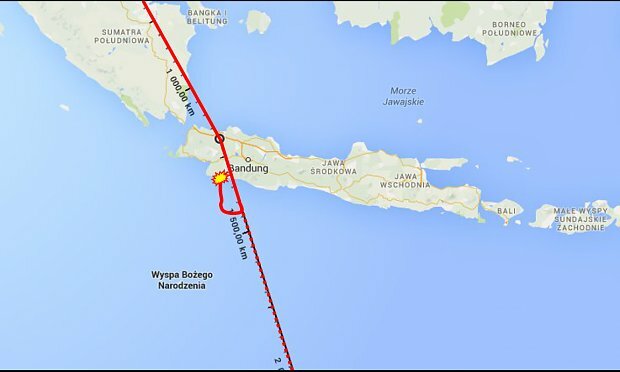 Pilot made obviously immediate U-turn and the aircraft was heading now the Java island. Crew wanted to make an attempt of landing in an airport in the city of Jakarta. However, one more problem occurred. Before the airport, on the southern coast of the island there is a mountain range. The captain calculated, that with current descending speed and distance the airplane won’t be able to fly over the mountains’ peaks. 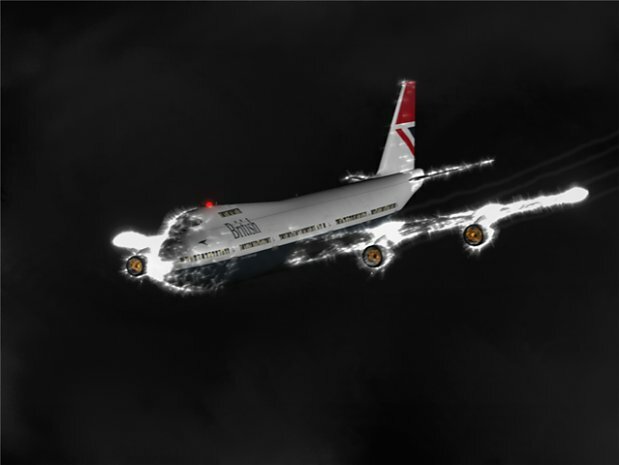 The faith of the aircraft and all 263 people on-board was therefore sealed, since there were only two options left: either crashing on the mountain slope or an attempt of water landing on the Indian Ocean, but it had never been performed with Boeing 747 yet. It’s not entirely sure why, but the captain decided to maintain the heading towards the island. He must have hoped, that he had mistaken in the calculations. At the same time however, he probably made the best possible decision, which finally helped to rescue all the passengers, but let’s not go out of order. When the aircraft was approaching the island and the mountain range at the same time, an unbelievable thing happened. As sudden as they had switched off, now all the engines started working again! Pilots weren’t thinking long about a reason for it, because they wanted to land in Jakarta as soon as possible and now they finally had an opportunity to do it. However, when the airplane was approaching the runway there was one more problem, which occurred. Despite the nice weather and the clear sky, pilots were unable to see the runway lights. They saw them in just in a while before landing, but they’re still kind of hazy. Captain, thanks to his great experience has managed to land safely and no one, from all 263 people on-board got even hurt. The next strange thing was found out on the next morning – most of the paint was torn off the fuselage! The pilots must have felt, as if the situation had lasted for the eternity. In fact, everything happened within just several dozen minutes. The first problems occurred at 8:40 pm of the local time, while the moment when all the engines started working again, was at 8:56. I mention it for realizing the real timing of all the accidents. Now it’s a time however, to finally discover the cause of all of this, but contrary to appearances, the investigation lasted just for few days. Actually, all what happened had only one major reason – an Indonesian volcano called Galunggung, which had erupted several hours before the airplane got to this area. 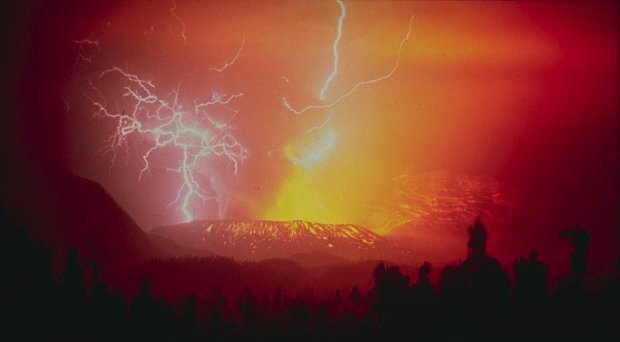 The volcanic ashes consists of no water, therefore they wasn’t seen on the weather radar. They contains however little particles of rock, that were hitting a fuselage, causing electrical discharges, seen later as a St. Elmo’s Fire.. The same particles were falling into the engines, melting there in the high temperature and lead to stopping the turbines. When the aircraft left the volcanic ashes cloud, the temperature decreased and the mass froze again and felt out of the engines, what made them start working again. The same particles of rocks caused noise in the radio conversation between pilots and the air traffic controller and the same particles, when hitting the fuselage both scratched the windshield making the view kind of hazy and torn off the paint from the aircraft’s body. This is the end of the one of the most amazing and unbelievable stories in the history of the aviation. By the way, now you have found out why, after the Icelandic volcano erupted in April 2010, the whole air traffic in Europe was grounded. Remember, that airplanes are anyway and still the safest mean of transportation. Crashes and such dangerous incidents occur rarely enough, so we’re able to precisely analyse it and pretend similar events to occur in the future.